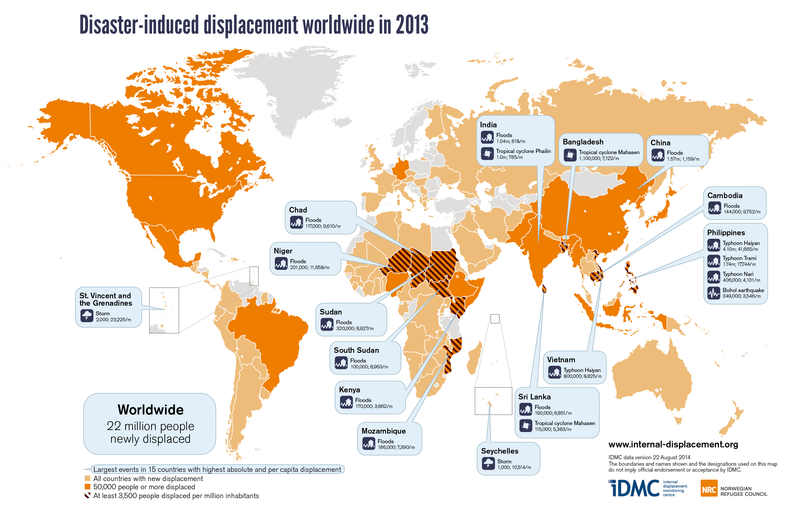 IDMC’s latest Global Estimates report shows that 22 million people were displaced in 2013 by disasters brought on by natural hazard events. As in previous years, the worst affected region is Asia, where 19 million people, or 87.1 per cent of the global total, were displaced during the year. Although both wealthy and poorer countries are affected, developing countries bear the brunt, accounting for more than 85 per cent of displacement. In the Philippines, typhoon Haiyan alone displaced 4.1 million people, a million more than in Africa, the Americas, Europe and Oceania combined. Viewed relative to population size, seasonal floods also caused significant displacement in sub-Saharan Africa, most notably in Niger, Chad, Sudan and South Sudan – countries with highly vulnerable populations who are also affected by conflict and drought.